Dead Sled has a brand new coffee. Draven coffee has arrived. It’s a bit hard to explain and easily misunderstood. Just like our friend the bat. For that reason our new black walnut coffee is named after our flying fox mascot Draven, who appears on the bottom of all Dead Sled bags. Here is how we explain our Black Walnut Draven Coffee. Black Walnut is used for cookies and deserts. It’s also used to make shotgun stocks and writers desks. 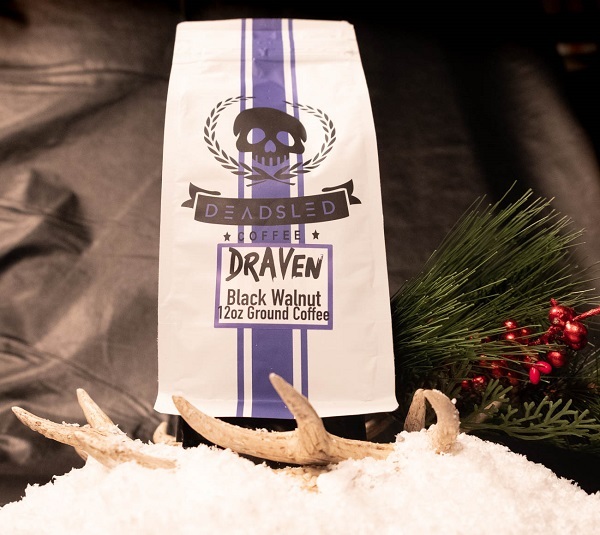 That’s what our Black Walnut Draven coffee tastes like. It’s easy to misunderstand it as something it’s not. Just like our bat friends. That clears things up right? Just trust us. It’s unique and amazing. More than 50 percent of bat species in the United States are either in severe decline or are listed as endangered. Bats are important, threatened, misunderstood and super cool! Bats are critical to our ecosystem and are often considered a “keystone species” in that they are essential for some tropical and desert ecosystems. In China bats are celebrated as symbols of good luck and happiness but everywhere else around the world they are loathed and feared. We at Dead Sled Coffee feel that education and conservation of the over 1,000 species worldwide is important enough for us to get involved. So starting today we will be donating a portion of every shirt purchased featuring our very own Vampire Bat Draven to Bat Conservation International. So get yourself a bag (or two) of our brand new Draven Blend and give back to the bats!